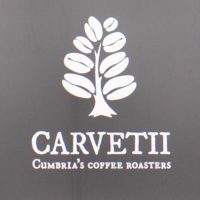 Carvetii, Cumbria’s Coffee Roasters, is somewhere that’s been on my radar for years, ever since I met Gareth and Angharad, the Welsh couple behind Carvetii, at the London Coffee Festival in 2014. Since, I’ve caught up with them at various coffee festivals around the country, including the Manchester Coffee Festival and, most recently, the Glasgow Coffee Festival. However, it’s taken me over three years to finally pay a visit to the Carvetii roastery in the heart of the Lake District. This delay is entirely down to me, and no reflection on the quality of their coffee, which I’ve always enjoyed. I’ve wanted to feature Carvetii for a while, partly because it represents an object lesson in how to build a speciality coffee business in a non-speciality area from the ground up. Gareth and Angharad are also some of the most thoughtful people I’ve met in my five years of writing the Coffee Spot. Carvetii is an example of doing a few things and doing them well: there’s a seasonal espresso blend, three single-origins and a decaf. These will soon be joined by a second espresso (either a single-origin or another blend) plus the occasional experiment, designed to showcase the coffee. Carvetii Coffee Roasters is firmly rooted in Cumbria, where you’ll find its coffee dotted through the Lake District and beyond. You’ll also find the new roastery amidst the stunning scenery of the northern lakes, in the small village of Threlkeld, east of Keswick. Carvetii moved here in March after five years in its original home, a small, and by all accounts, rather cramped unit. Carvetii’s new home is a joy to behold, not least for the magnificent backdrop of the Cumbrian Hills. Inside it’s a spacious unit with a mezzanine level, home to the training labs and office, leaving downstairs free for the production side of things, centred on a 12kg Probat roaster dating from 1980, which has seen its fair share of refurbishments and modifications along the way, including new burners fitted just a week before my visit. Carvetii’s story of steady, organic growth is one which I’ve followed over the years. Cumbria’s not a natural hotbed of speciality coffee and like plenty of roasters around the country, Carvetii’s had to build a market for its coffee as it’s gone along. This means working closely with local businesses, providing them with not just coffee, but with support and training. Indeed, a word you’ll often hear when talking with Gareth and Angharad is partnership, something which Carvetii has in common with Winchester’s The Roasting Party, a very different business on the face of it, but with a very similar philosophy. The two roasters also share a dislike of guest coffees. In Carvetii’s case, Gareth fears that the trend for using guest roasters is difference for difference sake. He’d rather see coffee shops using guests to highlight something about the coffee and, putting his money where his mouth is, Carvetii is launching an Ethiopian Double Bill, two coffees from the Guji Gigesa Mill, one naturally-processed and one washed. The aim, as Gareth explains, while Angharad prepares two V60s, one of each coffee, is to highlight the impact of processing. This starts with the green beans themselves. As a rule, washed coffees (where the coffee cherry is removed from the bean by washing) have a uniform blue-green colour. In contrast, naturals (where the coffee’s left to dry in the sun, natural fermentation breaking down the cherry) are more yellow-green, with much more variation in colour. These differences are noticeable in the brewed coffee: the natural was a gorgeous, rich, fruity coffee, bursting with flavour, while the washed had a cleaner, sharper taste. I was given a bag of each to take home and am currently enjoying the washed through my Aeropress, reserving the natural for my pour-over filter when I want a metaphorical punch in the taste buds. One of the challenges of roasting for a predominantly Cumbrian market is the water, something which has exercised Gareth over the years, to the extent that the new roastery’s espresso lab is split in two. One side is supplied with Cumbrian water, the other, “mineralised” water (Cumbrian water with added magnesium). The aim is simple: every coffee that Carvetii roasts should extract just as well in both waters (you can read a detailed account of this via an experiment that Carvetii ran at this year’s Glasgow Coffee Festival). Coming full circle back to training, having grown into its new space, Carvetii is planning a further expansion, having acquired the adjacent unit, which it will knock thorough. The additional space will allow Carvetii to move its storage next door, with the space freed up under the mezzanine earmarked for the Carvetii School of Coffee, providing training for public and trade alike in 2018. You read it here first! March 2018: I’ve just heard that Carvetii has won the “Best Drinks Producer” is this year’s Cumbria Life Food & Drink Awards. Congratulations to Gareth & Angharad. This entry was posted in Keswick, Meet The Roaster, Roastery and tagged include by Brian Williams. Bookmark the permalink. I have been (see what I did there) meaning to get in touch for a while to challenge your statements along the lines of “Cumbria is not a specialty coffee location”. This has come up in another context – crime – it seems virtually non existent in The Lakes but if you correct for population it is much the same as most places. The same I suspect applies to coffee roasters/specialist coffee shops. Carvetii/Red Bank/Rinaldo’s/Mr Duffin’s/Farrer’s roll off the tongue fairly readily and are all within a few miles of each other. Then there is Homeground/Copper Pot/Rattle Gill Cafe/Farrer’s Cafe, and Rinaldo and Mr Duffin have basic though thoroughly enjoyable cafes attached to their roasteries. And More? do fantastic bread and cakes as well as coffee, and Cafe Ambio – despite being a chain – does the best scones I have ever had – eating one fresh from the oven – they bake them several times a day – is like going to heaven. Enough said! Keep up the excellent writing, and have a Happy New Year. Thanks for getting in touch. You raise some interesting points, but before I response, just to let you know I’ve moved this comment to the Carvetii Coffee Roasters post where I think it’s more appropriate. I also stand by that statement, which is largely a reflection of what Gareth and Angharad have told me over the years. It’s also a historic statement: I’m talking about the work that they’ve done over the last five years in introducing speciality coffee to the area and building up the market. They’re not alone in that, but I believe that they’ve led the way. So, if I’ve given the impression that I believe that Cumbria is not a speciality coffee location, I apologise: that was not my intent (I should also apologise since I sometimes conflate the Lake District with the wider county of Cumbria). The point you make about population density is very valid. Cumbria and the Lake District also has a large influx of visitors which, I believe, can hinder speciality coffee shops building an on-going relationship with their customers. You’re right that there is a surprisingly high density of roasters in the Lake District. Although I’ve never done a systematic study, I suspect that Cumbria is going to be high up there on a list of roasters per head of population. What I think your point also highlights is that the area is definitely being roaster-led. The ratio of roasters to top-quality coffee shops is maybe 1:2, whereas my feeling is that in most parts of the country, that’s an awful lot higher. Although not terribly scientific, a quick count in the North England and Wales Independent Coffee Guide has a ratio closer to 1:4. Anyway, with luck 2018 will see me back in the Lake District. Mr Duffin and Rinaldo are on the list and I’m hoping to make it up to Carlisle as well. I’m also seeing Red Bank’s coffee around a little more.